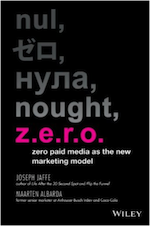 Jaffe Juice: How many social media experts does it take to make 2009 predictions? How many social media experts does it take to make 2009 predictions? The answer is not 15 contributors (David Armano, Rohit Bhargava, Pete Blackshaw, Chris Brogan, Todd Defren, Jason Falls, Ann Handley. Joseph Jaffe (Me), Peter Kim, Charlene Li, Ben McConnell, Scott Monty, Jeremiah Owyang, Andy Sernovitz and Greg Verdino), but rather 1 leader.